The Pyroclasmic Slooch (カジオコシ?, lit. : "Burning Back") is an enemy introduced in Pikmin 3, first shown at Nintendo's E3 2012 presentation. It is a slug-like creature that leaves behind a dangerous trail of fire. They are black in appearance, with stripes of yellow looping around their body in a pattern resembling that of flowing lava. They have two antennae near the top of their cone-shaped bodies. The Pyroclasmic Slooch is also covered in a combustible slime which it leaves behind as it moves. When killed, the Slooch shrinks considerably and loses its bright red stripes. It will also cease to burn, allowing all types of Pikmin to carry it. The Pyroclasmic Slooch's only threatening quality is its fire. It has very few hit points, moves at a sluggish pace, and its tongue attack is relatively slow, predictable, and can get only a few Pikmin at a time. Red Pikmin are the only type of Pikmin that can be used to consistently damage it when it sports its coat of fire. If a Slooch is lead into water, however, it can easily be attacked by any type, as its flame goes out. 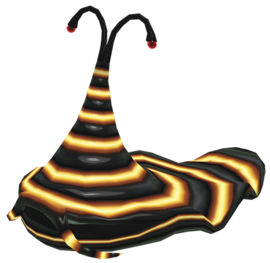 Though it is not too threatening when it is confronted directly, the Slooch's trail of fire can became a dangerous hazard for any non-Red Pikmin carrying items anywhere, as they will not attempt to avoid it. After being defeated, the creature's body will shrink and the trail of fire will linger behind it for a few seconds before fading. The Slooch is easy prey for Red Pikmin. Due to the creature's low speed and incredibly weak defense, you can take it out with ease with only a few Red Pikmin. It may try to shake them off, but it will likely not succeed in this provided you have at least five Pikmin on the creature, and if you swarm it with a group of 10 or more, it will likely not even be able to begin this animation. Provided you have Red Pikmin with you, its best to defeat any Pyroclasmic Slooch the first time you see it, as overlooking it may result in it catching a few Pikmin as you pass by or its fire trail later harming Pikmin on their way back to the Onion. Other types of Pikmin can actually attack the creature if they latch on to some points of its body. Rock Pikmin will also cause impact damage if thrown at it, however they must be called back before burning to death. The leaders can actually damage the Slooch, however, you must position yourself just right; the punch range is short, but getting too close will result in a damaging burn, provided you don't have the Scorch Guard. If done correctly, you can defeat a Pyroclasmic Slooch relatively quickly with only leaders, due to its few hit points. Also, if a Slooch goes in some water (for example, the puddles near the bamboo gate in the Distant Tundra), its fire will go out, allowing all Pikmin types to attack it more easily. It will only return to its fiery state if it touches the flames left behind by other Pyroclasmic Slooches. Touching a fire geyser will not restore its fire. A Pyroclasmic Slooch in the demo, showing the early name, "Pyroplasmic Slooch". "Pyroclasmic" is a play on pyroclastic flow, a fast moving current of hot gas or rock commonly found in volcanoes. "Slooch" is similar to the slug. In Japan, this creature is called カジオコシ?, which translates to "Burning Back", given how its back is constantly on fire. Internally, its name is kajiokoshi, which matches the Japanese name. In prerelease footage, the Pyroclasmic Slooch's name was written as "Pyroplasmic Slooch", which allures, on purpose or not, to plasm and the Plasm Wraith. Two Pyroclasmic Slooches being attacked by Captain Charlie and his group of Red Pikmin. Zooming in on a Pyroclasmic Slooch. Pyroclasmic Slooch at the Distant Tundra. This Pyroclasmic Slooch can't release fire because it went in a puddle. E3 2012 screenshot of a Pyroclasmic Slooch having caught some Pikmin with its tongue. Blue and Yellow Pikmin on a Pyroclasmic Slooch. If they are correctly launched on the Pyroclasmic Slooch, Blue, Yellow Pikmin and Winged Pikmin will be able to attack it without burning up. In the Distant Tundra, there's a group of Pyroclasmic Slooches in the cave where the Bulbear and fire geysers are found. After discovering the ultra-spicy spray, the middle Pyroclasmic Slooch will sometimes drop a dose of it. This page was last edited on December 5, 2018, at 11:59.